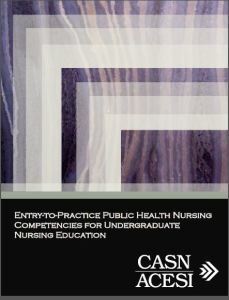 Entry-to-Practice Public Health Nursing Competencies for Undergraduate Nursing Education - Canadian Association of Schools of Nursing / Association canadienne des écoles de sciences infirmières (CASN / ACESI). In 2012 CASN began a project funded by the Public Health Agency of Canada (PHAC). One of the project goals was to support the integration of current and relevant public health content into baccalaureate nursing education by creating core competencies that would detail the knowledge, skills, and attitudes new nurses need to learn in this particular area of health care. The purpose of this document is to detail the public health competencies that all students completing a baccalaureate nursing program should acquire over the course of their undergraduate education. Each competency is accompanied by a set of indicators that identify the specific knowledge, skills, and attitudes that nursing students must gain in order to develop the particular competency. The competencies and indicators provide direction for curriculum development and for educators teaching in the area of public health. They are intended to build on, but not replace, other curriculum elements. The competencies were developed using an environmental scan, extensive stakeholder consultations, and a modified Delphi process. A Task Force of experts in public health nursing was involved in creating multiple iterations of the document beginning in January 2013 until the document was finalized in May 2014. Click here to view the Entry-to-Practice Public Health Nursing Competencies for Undergraduate Nursing Education.